Kogod School of Business at American University hosted scholars and practitioners from around the globe last week for the second annual Sovereign Wealth Funds (SWF) Conference. These thought and opinion leaders gathered together for panels and discussions on the political climate's affect on SWFs. 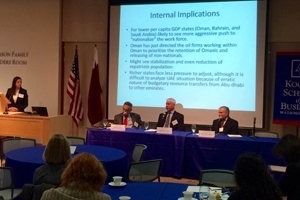 During the conference, Patrick Theros, President of the U.S.-Qatar Business Council, moderated a discussion panel. Theros touched on the long-term orientation of funds and how they are used, while the panel focused on country specific matters. Panelist Geoffrey Davis, partner at Squire Patton Boggs, used his experiences with SWF to discuss uncertainty and fund liquidity in less stable areas. Davis works with more than 10 funds, worth almost one trillion dollars, for many Middle Eastern countries. In addition to discussing financial uncertainty, Davis talked about cultural differences between the Middle East and the United States. In the Middle East, focus is on building local talent to run organizations at a considerably younger age than in the United States. The next panelist, Dr. John Willoughby, an AU economics professor, addressed the economic and geopolitical implications of fluctuating petroleum prices for SWFs. "Sovereign Wealth Funds are understudied but very important in legal, financial and economic aspects that this conference addresses," said Willoughby. After talking about the history of SWF's, Dr. John Duke Anthony, president and CEO of the National Council on U.S.-Arab Relations, called for a United States reality check. Anthony said the United States can no longer have a financial 'number one' attitude and must look to other countries to cooperate with financially. Finally, Ambassador Mohammed Jaham Al Kuwari, from Qatar, spoke about country relations. He focused on Qatar and the United States and how the two countries are benefitting from becoming economically close. Thanks to conferences like these, Kogod continues to build and cultivate relationships with prominent thought and opinion leaders on important topics, such as SWF's in the Middle East.